Servicing the four winches on Eximius has been on my mind for quite a while. 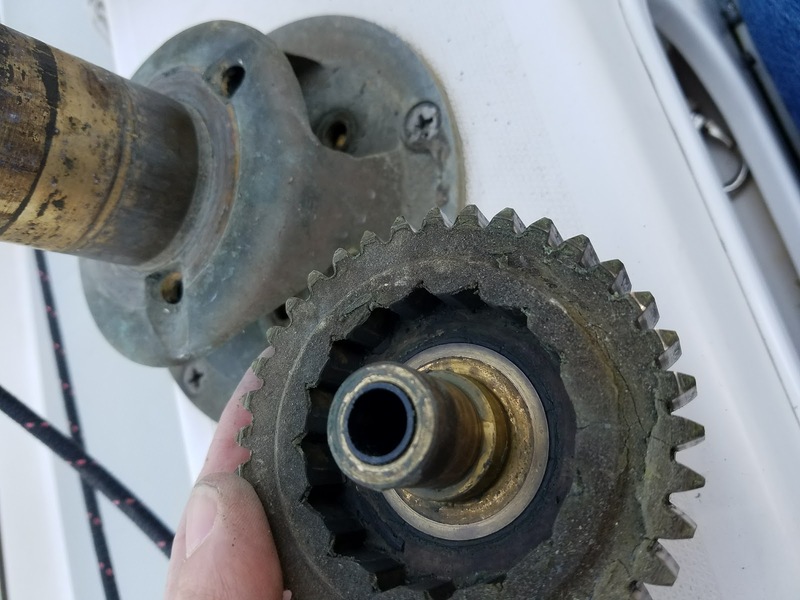 I know they have not been serviced in the past 17 months and not sure when any of the previous owners serviced them. 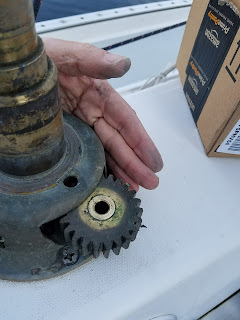 I spent quite a while reading up on the web about how to do it, what materials I would need and when and where to service them, even should I get them serviced by a pro! 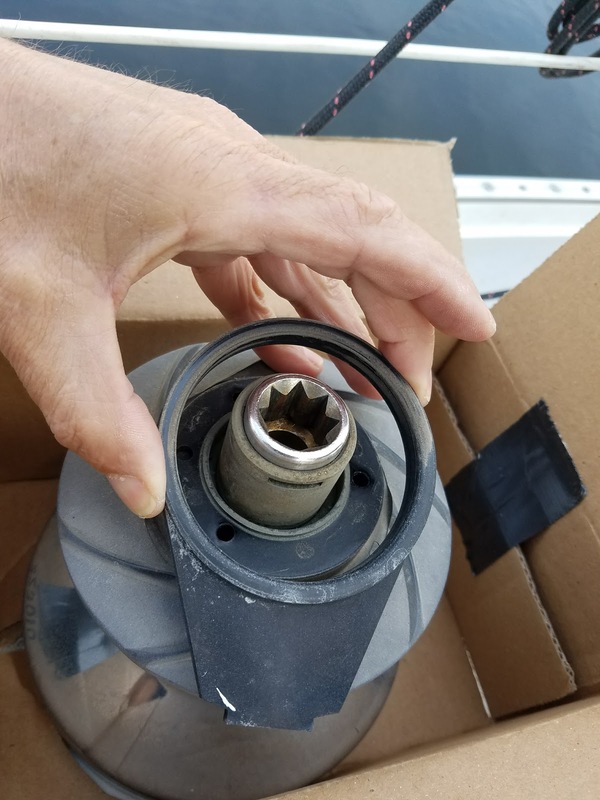 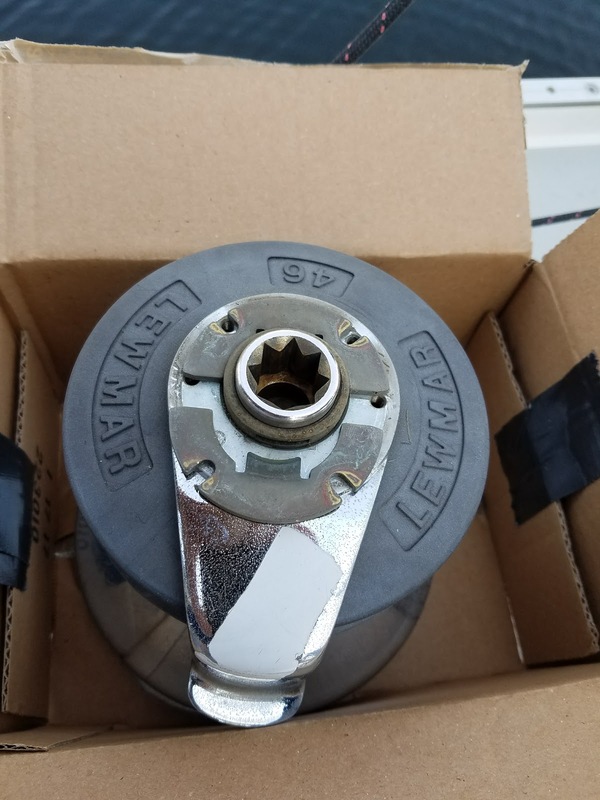 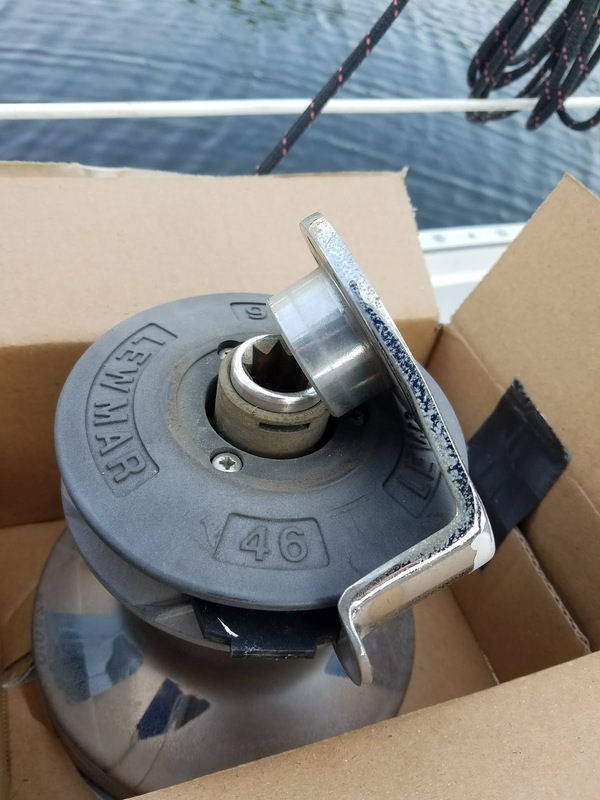 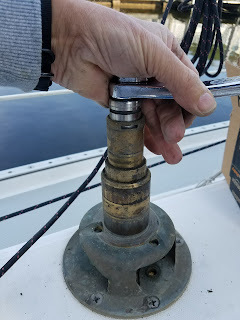 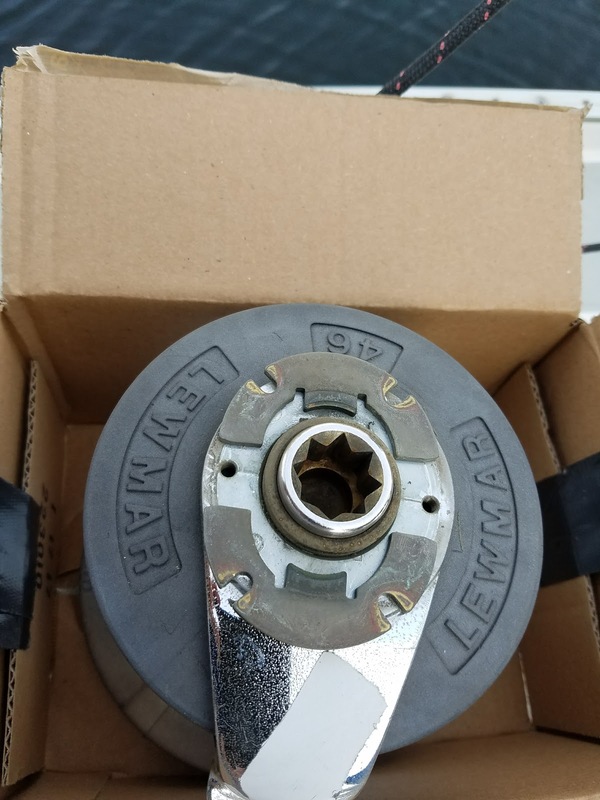 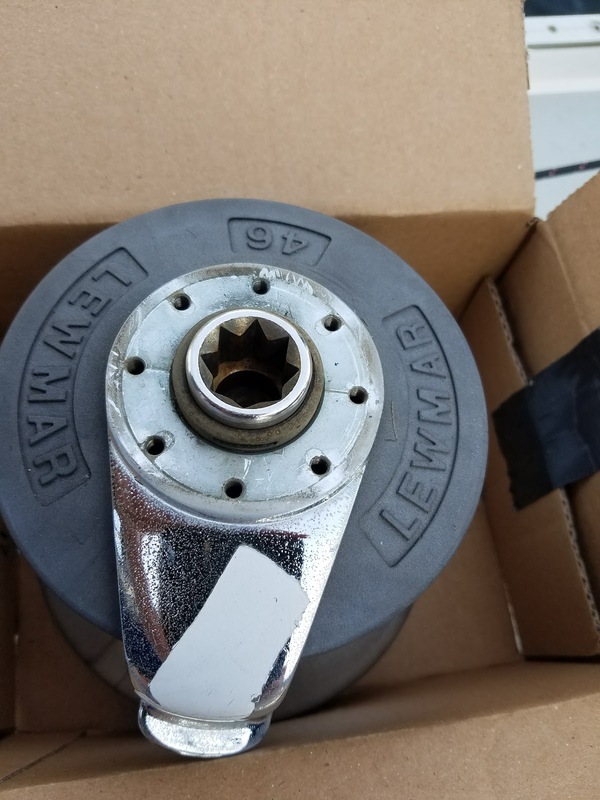 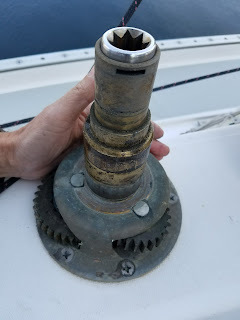 I can't think of a good analogy about what a winch is to a boat compared to anything on a car, but having winches to help maintain the correct tension on the sail control lines is a big deal. Winches have only been around for about 2,500 years! 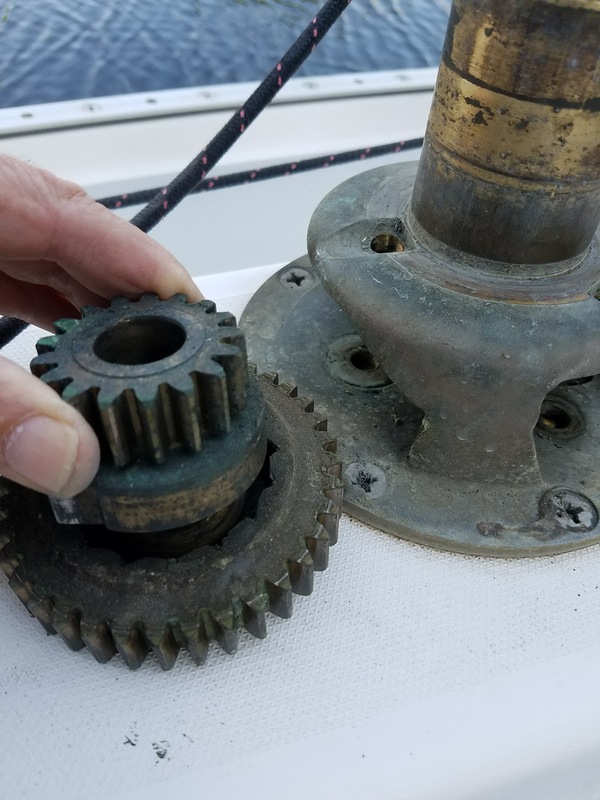 and modern winches are a beautiful thing, if they are maintained. 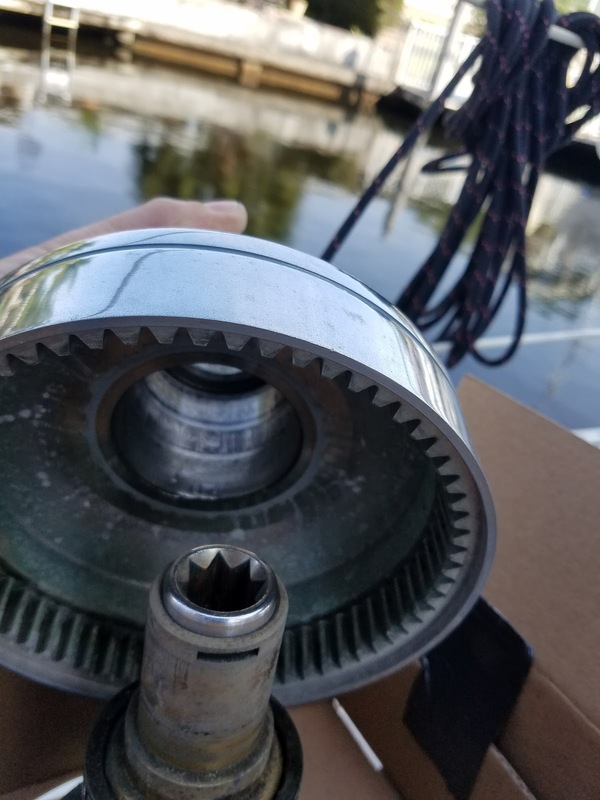 A broken winch is totally useless. 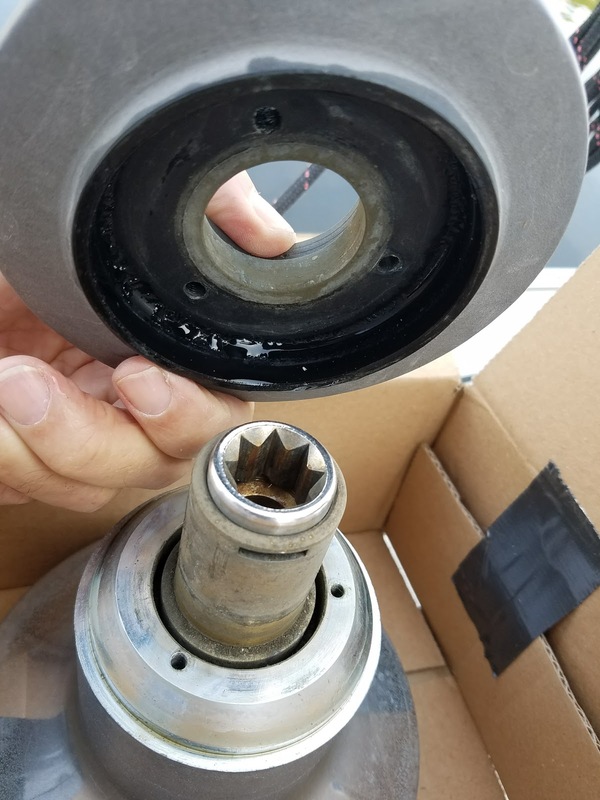 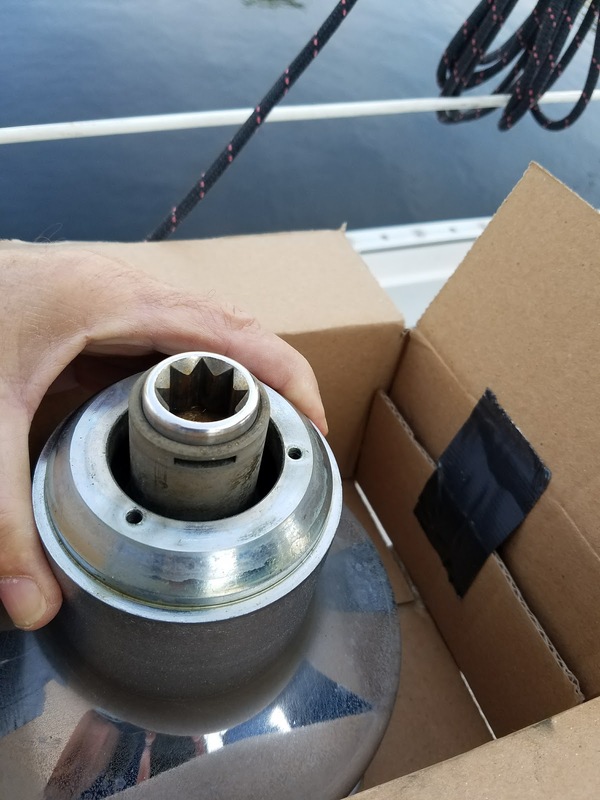 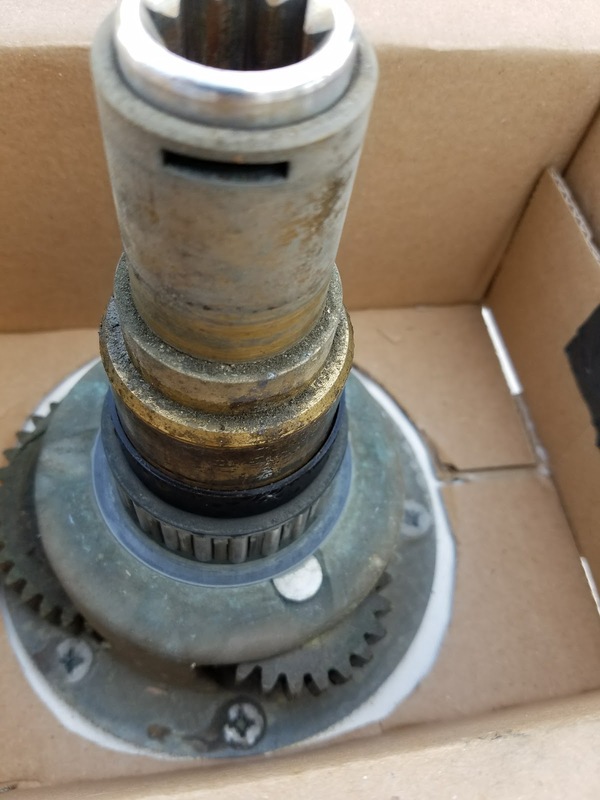 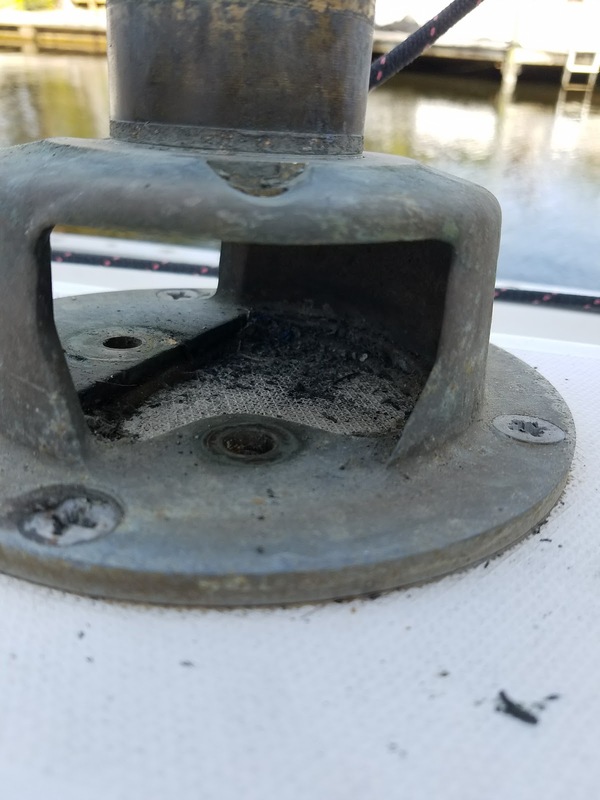 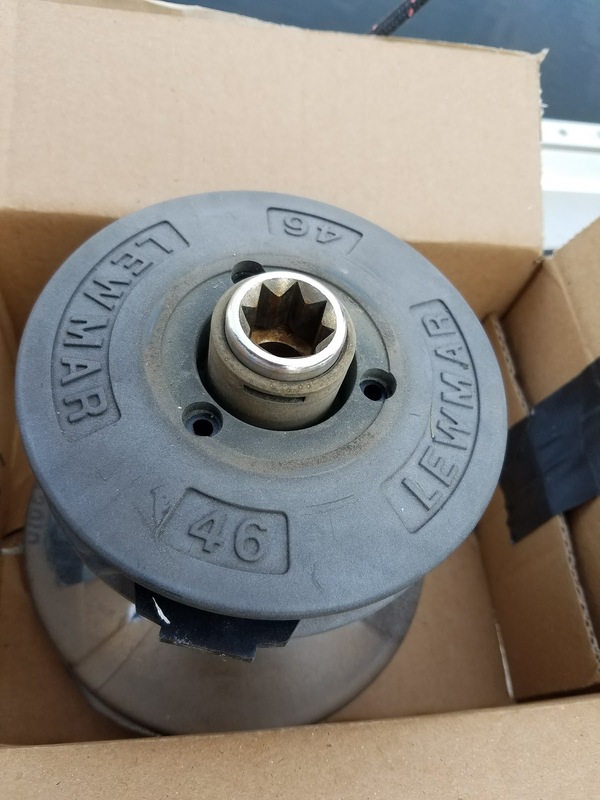 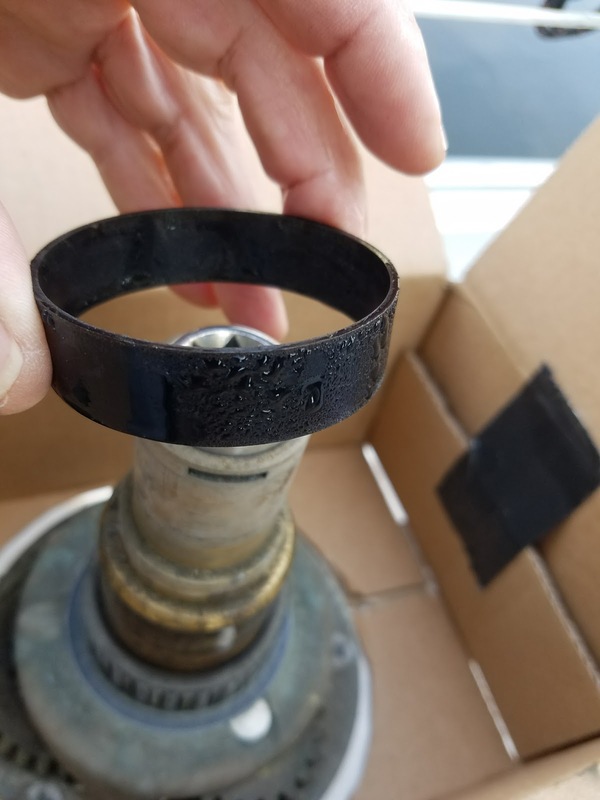 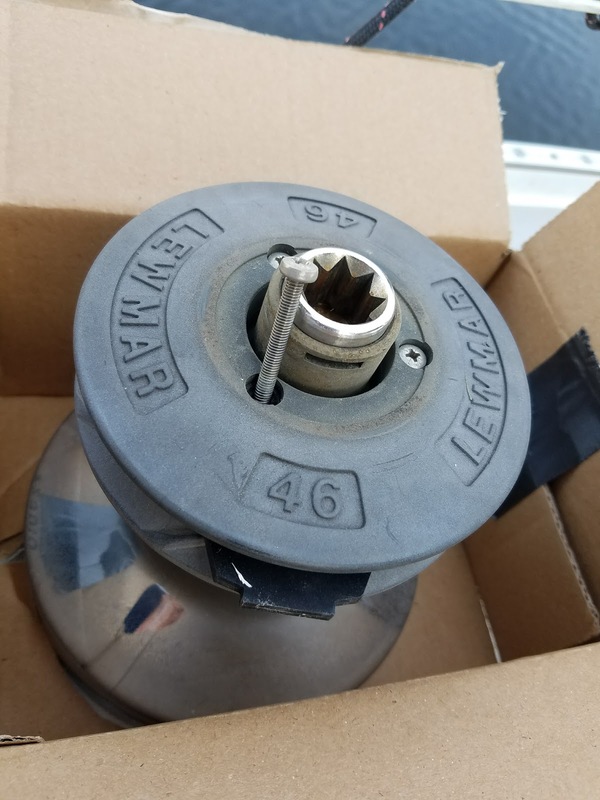 I have heard horror stories about what folks found when they tried to service their winches. From the stories of bits flying off the boat into the water to the winches being so badly seized up that it's impossible to service them. So I began this job with quite a bit of trepidation. 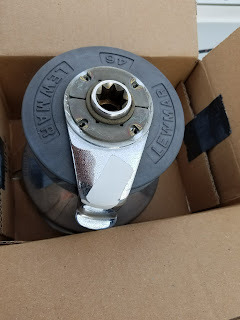 In an attempt to prevent parts falling off the winch during dismantling, I followed the advice of others and cut a disc out of the bottom of a cardboard box and surrounded the winch with the box. Then 4 Screws removed to get the the Main Winch spindle retaining clips. 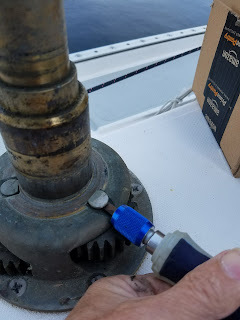 The Screws came out easily - Phew! 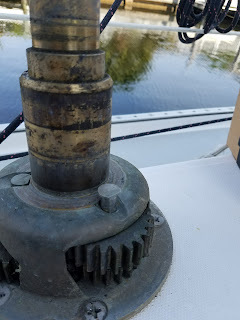 I had a plastic caddy nearby to put small parts as they came off the winch. 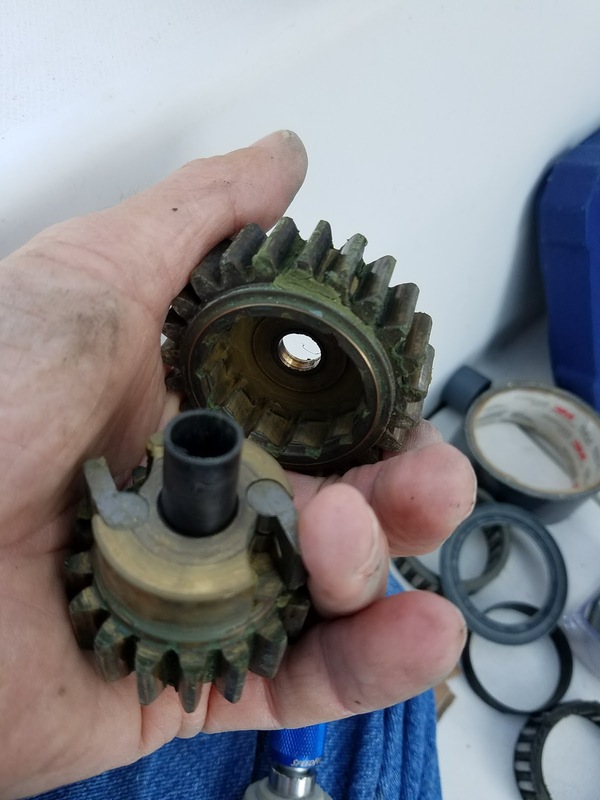 Here's a series of pics that I took as I progressed. 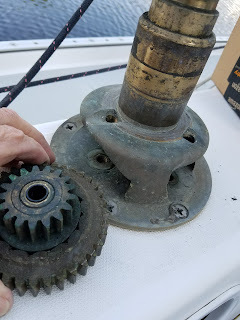 The reason for taking them was simply to allow me to look back at them when reassembling the winch. 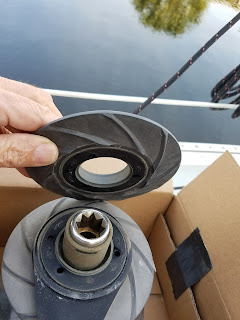 Once the line hook was off, the next part was to remove the self tailing disks. Once the selftailing disks were off, the Drum was simply lifted up off of the main spindle. 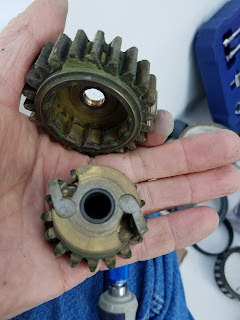 Next, time to remove the bearing races and spacers. 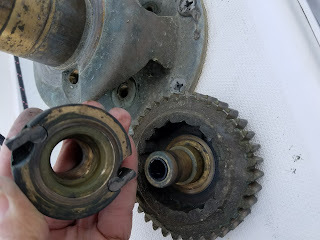 Now the two speed gear spindles can be seen, they were stiff to remove but not really difficult. 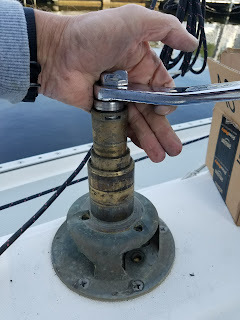 I used the Winch handle to pull the spindle out the top of the winch spindle housing. 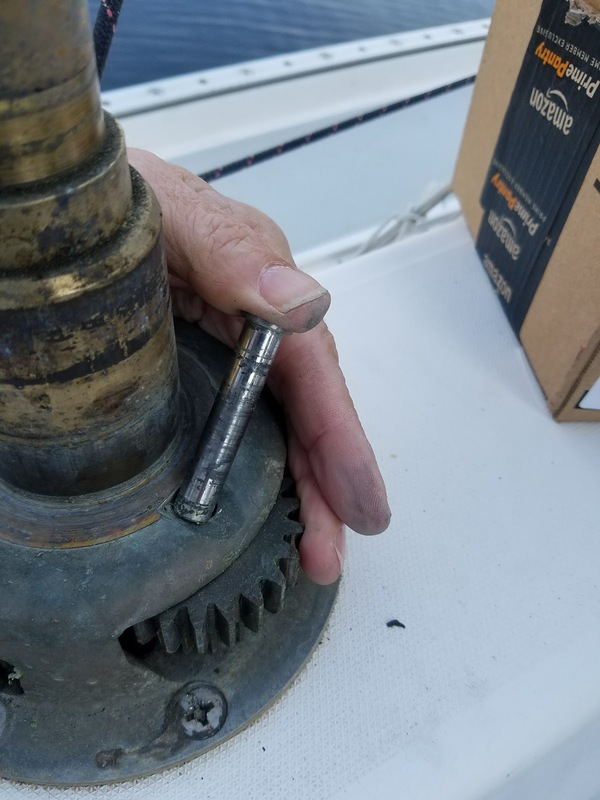 It was pretty stiff, felt definitely un-lubricated. 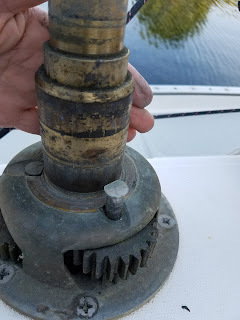 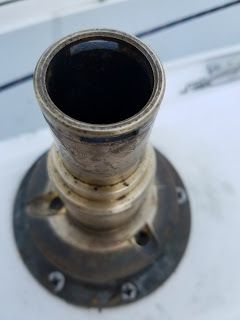 Lots of grot on the inside of the base and the main spindle tube was totally dry with a crud build up, have no clue what it was, I cleaned it out using Simple Green and rags. Then I spent a coule of hours cleaning each piece. I used a gentle green pot scourer and plenty of simple green. 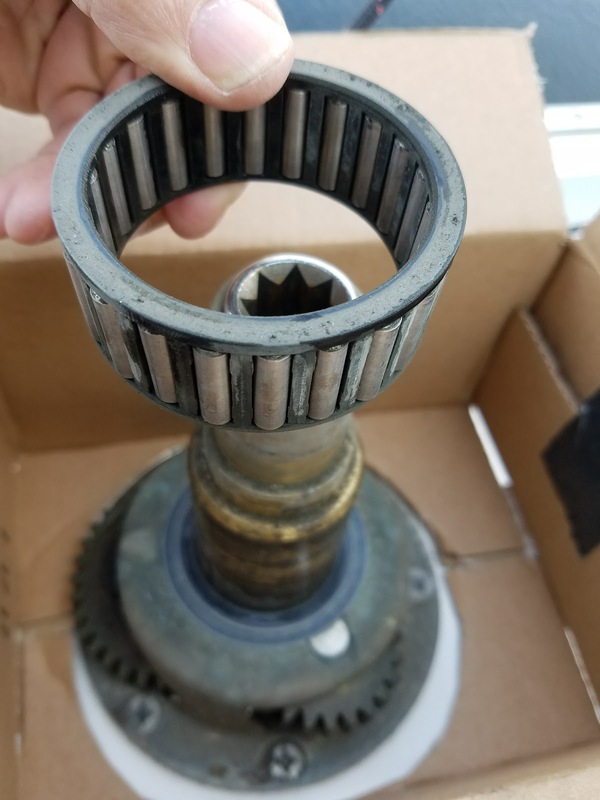 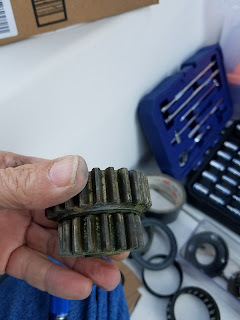 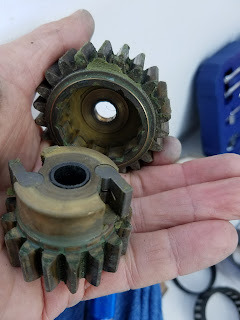 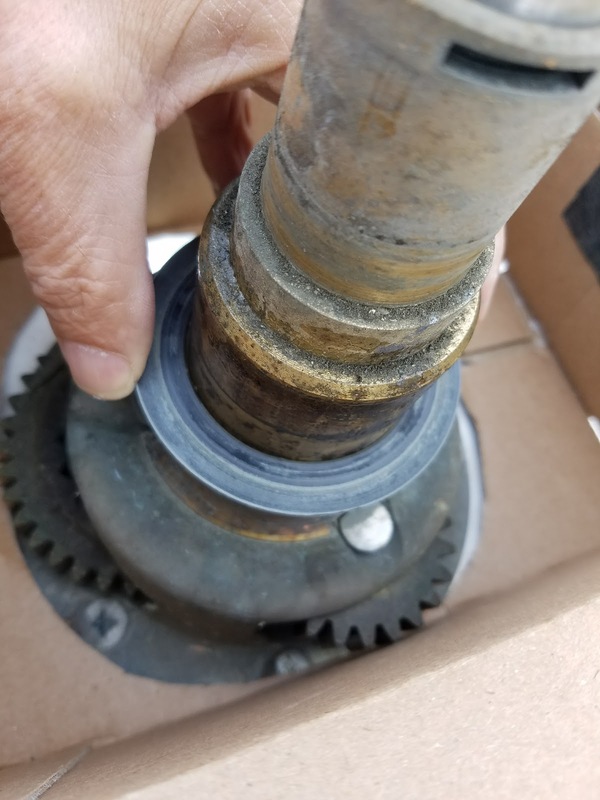 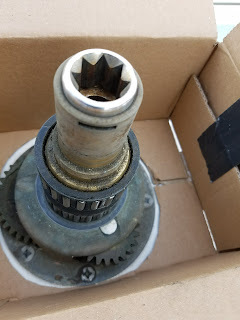 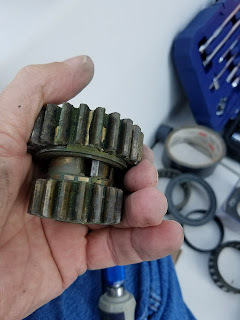 I had carefully scratch off some of the really hard crud that was inside the gear teeth, but other than that, everything cleaned up really well. 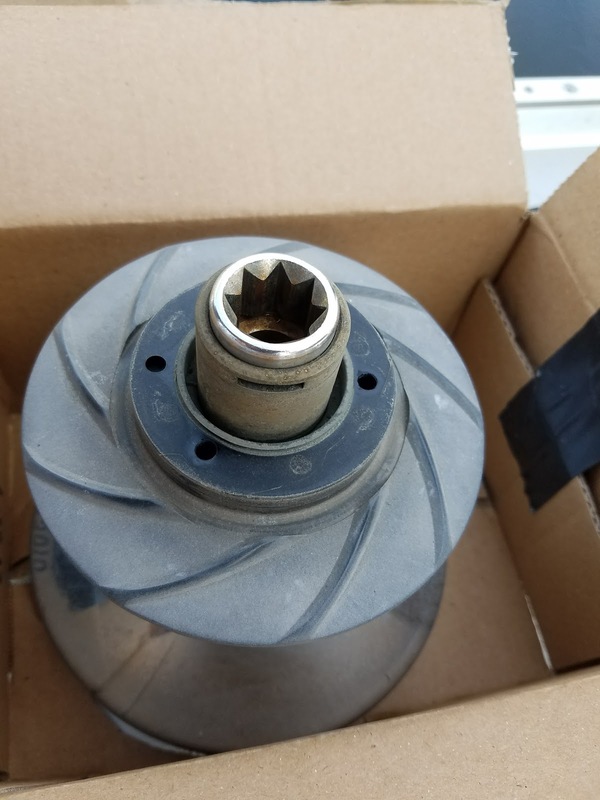 Sorry, didn't take pics of the shiny parts. 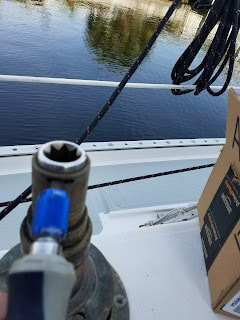 When putting it back together I used small amounts of Super Lube and a light water proof grease on the palls. 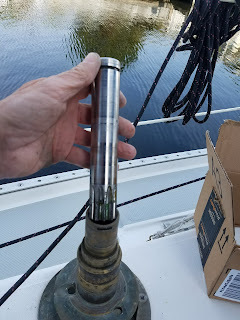 It went together really well and the difference in operation was immediately obvious: No screeching as the handle was turned, in either direction. The drum spun nicely and the two speed gearing worked perfectly. 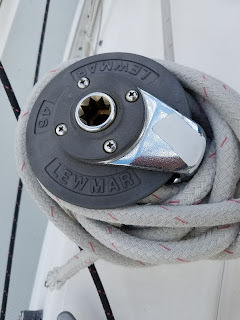 Now to get the other 3 winches done, I hope I'm as lucky with them as with this one.